The apple tree (Malus pumila, commonly and erroneously called Malus domestica) is a deciduous tree in the rose family best known for its sweet, pomaceous fruit, the apple. It is cultivated worldwide as a fruit tree and is the most widely grown species in the genus Malus. The tree originated in Central Asia, where its wild ancestor, Malus sieversii, is still found today. Apples have been grown for thousands of years in Asia and Europe and were brought to North America by European colonists. Apples have religious and mythological significance in many cultures, including Norse, Greek, and European Christian traditions. Factory apple powder bulk apple juice powder A typical apple serving weighs 242 grams and provides 126 calories with a moderate content of dietary fiber (table). Preliminary research is investigating whether nutrients and/or phytochemicals in apples may be preventive against the risk of some types of cancer. 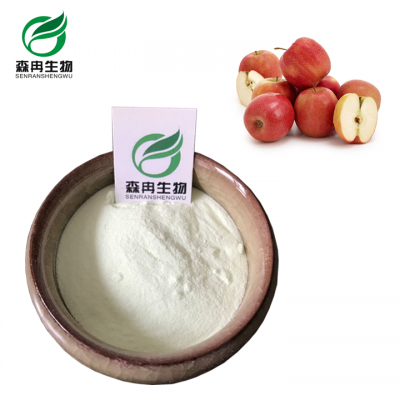 YesHerb apple powder is made from natural apple juice, with good water solubility and natural flavor of apple. organic apple powder is made under low temperature, rich in vitamins. organic apple juice powder has rich nutrients. 100% made by organic apple juice, have good solubility in water. Used in foods, beverages, cold drink, and cakes. Application Foods, beverages, cold drink and cakes.